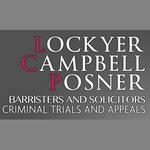 Lockyer Campbell Posner is a criminal law firm based in Toronto, Ontario. Established in 2005, the Toronto criminal law firm represents clients on all provincial, criminal, and regulatory offences. Philip Campbell is founding partner of Lockyer Campbell Posner. Products Carried: Lockyer Campbell Posner offers legal representation for clients charged with criminal offences. Located in Toronto, ON, the criminal law firm represents clients at trial and on appeal. Areas of practice range from the wrongly convicted to drug, tax, driving, and homicide charges. Lockyer Campbell Posner Toronto strives to attain the highest standards in trial and appellate advocacy.